UCCFS: Chicken Pot Pie vs Turkey with Stuffing & Gravy – I Love It Spicy! The Ultimate Chilehead Comfort Food Showdown continues with what I believe will be one of the most gut-wrenching choices to date. There have been a few close matchups, but this is the first that pits a #4 seed in Chicken Pot Pie vs #13 seed Turkey w/ stuffing & gravy. When I put this contest together I omitted turkey in any fashion from my top 64. I did it on purpose because I didn’t know what I should say. What kind of turkey dish did people consider comfort food? Thanksgiving comes but once a year, and so I wasn’t sure this type of dish would be embraced. I figure someone would set me straight and lead me to what the comfort food should be label as. I had a few people tell me it should be on the list in some way with or without the stuffing or the gravy or maybe in a sandwich. So I went with both the gravy and stuffing and left out the turkey sandwich. All the 13 seeds were suggested by chileheads, but this one was in my opinion the strongest of the 4. Hash Brown Scramble and Biscuits ‘n Gravy got sent to the dogs, and Enchiladas which is next probably won’t be too much competition against meatloaf. While Chicken Pot Pie is the higher seed, it might be too high of a seed, yet you can not underestimate the love of a good flaky-crusted chicken pot pie. 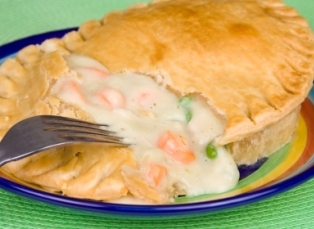 From the veggies to the moist chicken, the pot pie covering is where people start and finish with. The gravy inside varies from pot pie to pot pie, but the best know how to make you eat until you lick the plate clean. The gravy and stuffing combo with the turkey is so subjective to the individual. Some like a thick darker gravy and others like it thin and more like a lighter style. Then there is the stuffing. There isn’t one set way to make it, and you can play with the recipe day and night, but usually Mom knows best, right? I like my stuffing with raisins, slivers of toasted almonds and a cinnamon edge that makes me feel like Thanksgiving is here. I do not have stuffing that often, as I prefer mashed potatoes more, but I can go for either starchy side. Not a huge turkey fan, but there is something special when you pure the gravy on it that makes anyone a fan. Together with the stuffing, the turkey and gravy becomes a triple threat that is shaking the flaky crust off of the chicken pot pie. Now you have to make the choice. What will it be? Tell us what you think. I love chicken pot pie, but the turkey and stuffing just says “it’s the holidays and family time”…. there’s a place getting ready to open up in the town we do farmers market. They serve Thanksgiving dinner all year. Can’t wait till it opens. Sorry everyone, the poll was set to closed instead of open. Go and vote now! now if it was Turkey smothered in hot sauce then yes 🙂 .. As you can tell i never eat normal . I really don’t think i eat one food with out hot sauce ..
We have a clear winner, Turkey w/ Gravy & Stuffing. Next up will be the Reuben sandwich in the 2nd round. Another great match-up.